Global pioneers of brands they both founded which have transitioned into multimillion-dollar lifestyle businesses, Jose Bryce Smith and Pip Edwards have joined forces to create two essentials travel sets. Jose Bryce Smith Founder, Original & Mineral, Pip Edwards Creative Director / Co-Founder and Claire Tregoning Founder / Director of P.E Nation are all Australian born female entrepreneurs who believe in the ultimate lifestyle choices and empowering others through their passion. “Having always been personally obsessed with health and wellbeing, I have loved PE Nation since it first catapulted on to the Australian scene. Pip and Clare have a global strategy which is synergistic with O&M – health, fashion, shampoo meets active wear” – Jose Bryce Smith. These women have partnered to create the ideal PE Nation x O & M capsule collection for women on the go. The limited edition cosmetics case features the signature P.E Nation colour-blocking and geometric lines and is sold complete with travel sized O&M Mini haircare & styling products. “P.E Nation and O&M share the same ethos of offering a complete solution that is accessible to everyone, everywhere, every-day. The O&M aesthetic and urban style perfectly align with P.E Nation – we’re two Aussie brands who bridge the gap between luxury and ordinary…and have a lot of fun while doing it.” Pip Edwards. A naturally organic synergy between the two local brands combines the worlds of fitness, fashion, haircare, beauty and wellness. 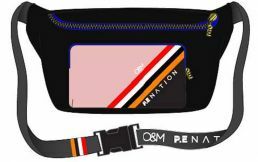 The P.E nation gift packs will be available from March 2019 at adorebeauty.com.au.